Motorized retractable clear vinyl panels are a great way to create a climate controlled outdoor room. 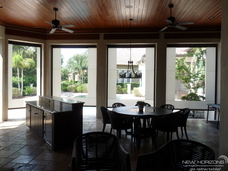 With a press of a button, your motorized retractable clear vinyl panels drop down into place, shielding your outdoor living space from the elements. You can protect your outdoor areas from the wind and rain, as well as keep the inside warm or cool, depending on the time of year. Motorized retractable clear vinyl panels are great for homes and businesses alike. Our motorized retractable clear vinyl panels are perfect for restaurants, bars, hotels and resorts with outdoor eating areas. Wouldn’t it be great to be able to seat your outdoor space year-round, regardless of weather? 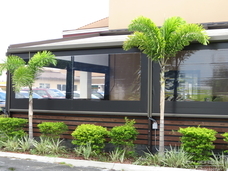 Imagine having your outdoor eating space full of hungry customers and our Florida afternoon storms roll through. Wouldn’t it be awesome to simply lower your motorized retractable clear vinyl panels and keep everyone inside safe and dry?